Americans have not always desired new sources of energy. Demand has needed to be created, and this has never been easy. George Shoemaker knew it was time to run. Despite his willingness to give away his product simply for the cost of its transport, a group of angry Philadelphians had obtained a warrant for his arrest. They denounced him to local authorities as a swindler peddling defective wares. Rather than wait for his day in court, Shoemaker snuck out of town along back roads and did not look back. What suspicious good was Shoemaker trying to sell? Surprisingly, the answer is coal. Shoemaker lived in Pottsville, Pennsylvania—about 80 miles northwest of Philadelphia—where large quantities of anthracite coal could be easily obtained. But after laboriously delivering nine loads of coal over rough roads to Philadelphia in 1812, the Quaker City’s citizens could not get it to ignite. They believed Shoemaker had sold them a useless stone and wanted justice. Shoemaker’s story captures an essential, yet often overlooked, dynamic of energy transitions. Getting consumers to adopt a new energy source is a substantial challenge. Most potential adopters find new energy sources unfamiliar, difficult to use, and therefore undesirable. Overcoming these obstacles requires enormous efforts by energy promoters to instruct users on the proper techniques, work with businesses to adapt their production techniques and develop the associated technologies such as stoves or furnaces necessary to use new fuels. Americans, in short, have not always desired new sources of energy. Demand has needed to be created, and this has never been easy. The material characteristics of anthracite coal made this challenge particularly acute. Anthracite refers to coal that has a high percentage of carbon—often 85 percent or even higher (bituminous coal has 50-85 percent carbon; semi-bituminous 35-50 percent; and lignite less than 35 percent). It has a hard and shiny appearance, and early nineteenth century Americans frequently referred to anthracite as “stone coal.” This high carbon content has two important implications. First, anthracite has relatively few volatile gases that aid the combustion process. As a result, one cannot simply toss a chunk of anthracite coal on a fire and expect it to ignite. Burning anthracite requires specialized equipment and considerable experience. Second, anthracite is a relatively pure fuel, and it burns hotter and with less soot emissions than other coals. Anthracite coal is relatively rare. Nearly all of earth’s coal reserves are bituminous, semi-bituminous, or lignite. 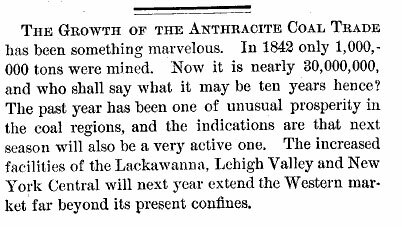 And were it not for contingencies of natural and human geography, anthracite would likely be a small footnote in America’s energy history. It turns out that the world’s most abundant source of anthracite coal is concentrated into a dense region of less than five hundred square miles in eastern Pennsylvania. This made it the largest source of fossil fuel energy in the early nineteenth century within potential reach of the most populated region of America at the time—the eastern seaboard between Baltimore and Boston. 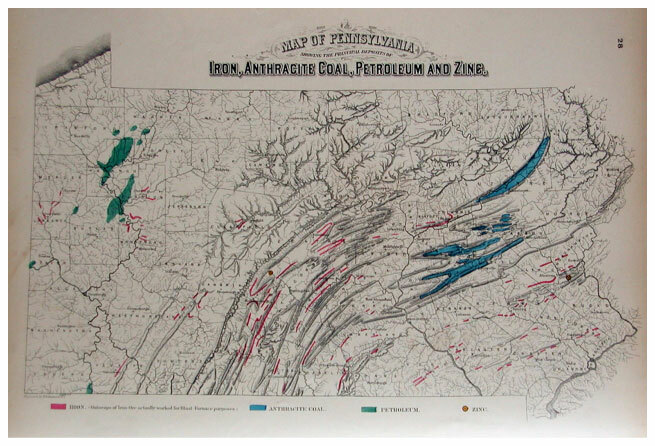 Due to this pairing of geology and population, eastern Pennsylvania’s anthracite reserves were in a unique position to power America’s first fossil fuel energy transition. When Americans first consumed coal in great quantities, they were using anthracite. Yet as Shoemaker’s example demonstrates, the adoption of anthracite coal was anything but inevitable. Anthracite promoters met with frequent failure. In 1806, for example, William Turnbull delivered a few loads of anthracite coal from the Lehigh Valley to Philadelphia for the use of the city’s Water Works. Yet the employees of the Water Works could not get the anthracite to burn in the steam engines that pumped water. In the end, they simply broke the anthracite it into pieces and scattered it in the streets as gravel. After his narrow escape from the law, Shoemaker decided to take a more active role in teaching potential customers how to use anthracite. He arranged to visit an iron rolling mill in Delaware County to demonstrate the potential advantages of anthracite. Though the foreman declared the coal to be stones, Shoemaker oversaw the process of igniting anthracite, emphasizing that the fire should not be poked and that the furnace door must remain closed. After a length of time, the furnace began emitting a heat more intense than could be obtained with other fuels such as charcoal. Others stumbled on to the secrets of burning anthracite through luck rather than skill. Josiah White and Erskine Hazard established two iron factories along the Schuylkill River a few miles north of Philadelphia in 1810. White and Hazard possessed advanced technical skills, including knowledge of the latest techniques in Britain and France. They pioneered many innovations include building the nation’s first wire suspension bridge and an iron canal boat. Yet anthracite confounded even their considerable ability. After acquiring a batch of stone coal, they and their workers spent the morning unsuccessfully attempting to light the fire. Frustrated and ready to give up, the men shut the furnace door and left for lunch. When one workman returned thirty minutes later, he was shocked to discover the furnace door glowing with heat. Though they did not know it, closing the door had directed the air to flow through the coal rather than over it, providing the proper conditions for ignition. White later calculated that the higher heat of anthracite allowed the men to roll iron with far less labor and fuel than with imported bituminous coal. He and Hazard became so impressed with anthracite’s potential that they became active promoters themselves in 1817, initiating a series of enterprises that became the Lehigh Coal & Navigation Company. When we think about coal today, we often think of large industrial consumers. Yet in the early nineteenth century, anthracite boosters did not see factories as the most promising customer base for their product. A market with much greater potential loomed larger in their imaginations: homes. Every resident of the northeast corridor in the early nineteenth century required a source of heat in their homes to cook their food, and more importantly, to keep their domiciles warm in winter. To meet these basic needs, families relied on the prolific bounty of America’s forests. An average family of six Philadelphians at the time annually burned at least eight cords of wood—a stack four feet high, four feet wide, and eight feet long. Wealthy families often used three times as much. Philadelphia’s more than 60,000 residents in 1820, therefore, likely consumed close to 100,000 cords of wood annually. As a ton of coal could offset about a cord and a half of wood, anthracite promoters knew they could achieve sales of tens of thousands of tons of coal, not simply a wagon load here or there. Turning dreams into reality, of course, meant engaging in the difficult task of educating residential consumers. Robert Roberts’ 1827 guide for servants captures the complexity of burning anthracite. The author dedicated fifteen pages to the techniques necessary for starting and maintaining an anthracite fire, prefacing his remarks with the observation that “Very few servants at first understand the method of kindling and continuing a fire of Lehigh coal, many will never learn, and many more . . . make but a bungling piece of work of it.” As Roberts explained, consumers needed to break coal into similar sized pieces (“about as large as your fist, if your hand is rather a small one”), choose the right type of kindling (“charcoal, unless dry hickory be preferred”), and avoid the cardinal sin of over-poking the fire (“judicious use of the poker is essential to the well-being of an anthracite fire”). To encourage homeowners to adopt anthracite, promoters distributed such guidelines, performed scientific analyses demonstrating the superior heating qualities of anthracite compared with firewood, and even engaged in direct demonstrations. Once Josiah White entered the coal trade, he instructed his wife to keep an anthracite fire burning in their home at all times so that prospective buyers could see how it worked. Unfortunately, the historical record does not provide evidence describing how Mrs. White felt about being told to allow visitors into their home at any time. In addition to learning the techniques to ignite anthracite, consumers also needed to invest in specialized technology. Because air needs to flow through pieces of anthracite and there must be space for the ash to fall away, homeowners could not rely on the open-hearth fireplaces they used for wood. Instead, they had to purchase specialized stoves or grates—an expensive upfront investment that discouraged many from experimenting with anthracite. In order to lower these barriers to entry, anthracite promoters worked with local manufacturers to increase their production of stoves and lower the costs. They helped stimulate a remarkable boom in stove design: from 1815 to 1839, the Patent Office issued 329 awards to stove manufacturers, nearly four percent of all patents awarded in this period. By 1831, consumers could buy stoves for as little as five dollars, bringing the material requirement for burning anthracite within reach of most working-class families. By 1850, anthracite came to be the most important fossil fuel in America. At this time, anthracite heated the vast majority of urban homes on the eastern seaboard, supplied the heat necessary to smelt iron, and powered steam engines in factories, steamboats, and railroads. Such success, however, took decades to achieve. While histories of energy typically pay great attention to advances in the production of new energy sources, they rarely devote comparable space to the mundane practices of teaching consumers how to use them. Yet as George Shoemaker learned all too well, failing to educate users can have disastrous consequences. Understanding energy transitions requires that we attend to the more humble domains of consumer behaviors. While these examples are specific to anthracite coal in the early nineteenth century, they capture a more general pattern. Similar stories can be told about the introduction of oil, natural gas, and electricity. In all these energy transitions, promoters had to work incredibly hard to convince consumers of the desirability of adopting new and unproven energy sources. Their efforts often took decades to succeed. Creating an energy transition has always been hard work. This historical insight should give encouragement to advocates of renewable energy sources. Many have lamented the slow spread of solar and wind technologies. Some critics have used this lag to suggest that renewables are inherently inferior to fossil fuels. But the history of energy suggests greater patience is warranted. Coal, oil, and electricity also faced considerable barriers to their adoption, many of which were linked to the fact that consumers found them unfamiliar, unnecessary, and undesirable. Only with active persistence by promoters, often sustained over decades, did these energy sources eventually come to be adopted. Similar time, energy, and persistence may achieve the same results for wind and solar. Christopher F. Jones is the author of Routes of Power: Energy and Modern America and an assistant professor of history at Arizona State University.